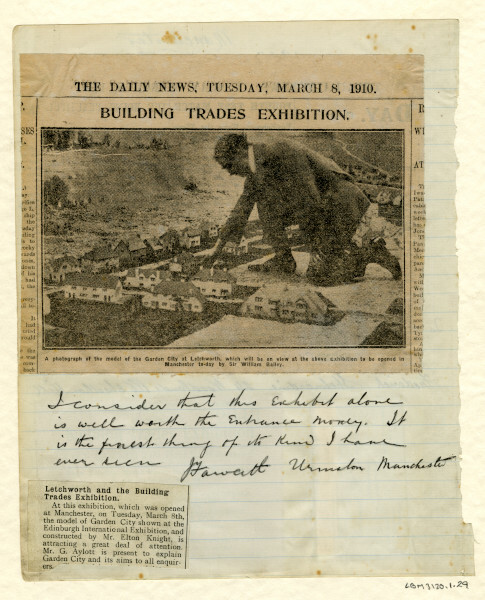 A newspaper article taken form The Daily News, March 8th, 1910 and entitled 'Building Trades Exhibition'. It shows a photograph of a model of Letchworth Garden City which was on exhibition in Manchester. The exhibition had been opened by Sir William Bailey. The model was constructed by Mr Elton Knight and was initially shown at the Edinburgh International Exhibition. Mr G Aylott was present at the show to answer any enquiries. Under the image written on lined paper affixed to the cutting is written ' I consider that this exhibition alone is well worth the entrance money. It is the finest thing of its kind I have ever seen. [Fawcett?] , Urmston, Manchester. This object was originally housed in the museum library files in the Societies and Associations drawer in the First Garden City Limited. 1902-59.